On June 21, 2016, Donald Trump met with 1,000 evangelical leaders in New York City. It was called a conversation about America’s future with Donald Trump and Dr. Ben Carson. 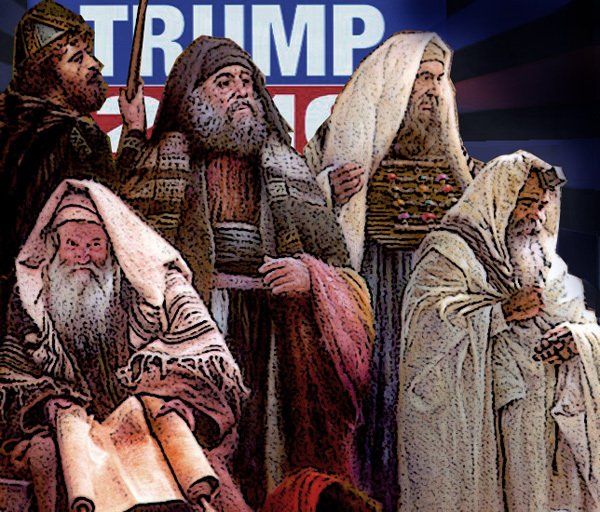 He met with them because he needs the evangelical endorsement’ which is the bottom line. He cannot win without the evangelicals. So he’s making promises to them, which sound good. Am I a doubting Thomas? The stubborn holdout? As a Christian, I cannot lie to myself, and I can’t lie to my kids…or to anyone about this. So I have made an assignment to find out the truth. Part of me wishes that I didn’t, because the further I dig, the more lies I have uncovered. As a minister and watchman of God, I believe it is my duty to examine Trump with discernment and honesty. As some of you may be noticing, this has been one of my recent disciplines. Why am I doing this? Because Jesus told us to beware of the leaven of the Pharisees and of Herod. But how many evangelicals are undertaking this discipline? Not many. I am also watching as many in the alternative media are also not doing it. At first the rebuttals above may sound clever, but when they are measured against the Bible, they come up short and also exhibit a lack of forethought. …or evil in the sight of the Lord. A large portion of today’s Christians don’t seem to care about the king’s report card. This confirms to me even more that this country is in a mess, because even the shepherds, the radio pastors, and the voices are sidestepping the major concern about Trump’s lack of integrity. Apparently not, and thus….fasten your seat belts and fill your lamps with oil because all of hades is coming to a city near you. My friends, watch this video and as you do, ask yourself if the evidence that is presented should be a concern. And also ask yourself this question, is Donald J. Trump being honest with us, about who he claims to be.